Sweet Baby James rocked Tanglewood. 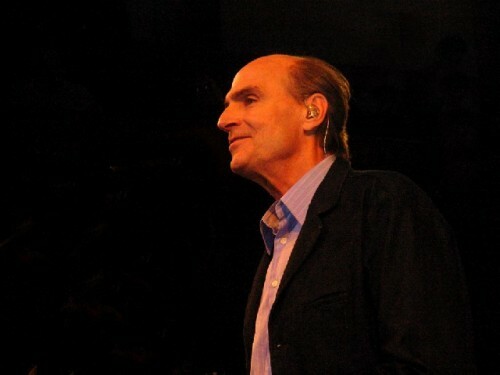 Giuliano photo. It was indeed an evening of Fire and Rain. Taylor and Yo Yo Ma enjoyed performing a Schumann lulaby. Hillary Scott photo. Sheryl Crow joined Taylor and Ma on Fire and Rain. Hillary Scott photo. Sheryl Crow rocked with JT. BSO photo. Crow is a classically trained musician. Yo Yo Ma was a special guest. BSO photo. What a difference a day makes. Just 24 little hours. 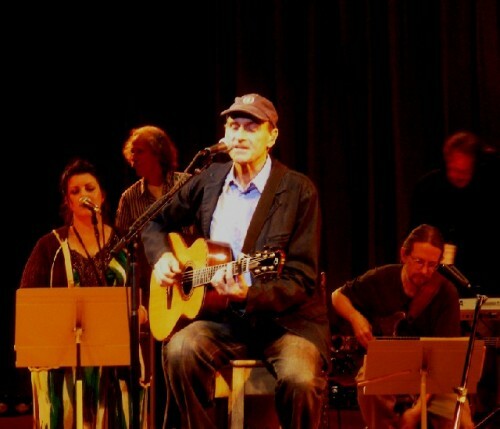 On Thursday in Ozawa Hall we heard a sliver of James Taylor and a lot of his band with four backup singers. On those occasions when Taylor offered a tune he opted for forgotten and neglected B sides. The audience was attentive and respectful but that's about it. Last night, before a sold out audience in the Shed, and a sea of brave souls weathering yet another miserable stormy night, Taylor was smokin'. The evening started in that familiar, throaty, evocative, low key, singer/songwriter mode. But as the program progressed, and he brought out guests artists Sheryl Crow and Yo Yo Ma, the momentum and energy kept building. A consummate showman Taylor ended the evening by ratcheting up the intensity. He was cooking as the audience stomped, clapped and cheered every grimace and nuance as JT and the musicians wailed through the night like Howlin' Wolves. Baby. Oddly, I found myself missing some of that intimacy and insight from the Thursday program that focused so intently on the superb band and wonderful backup singers. It felt that we really came to know them, their individual capabilities, and chops. Last night, as is the norm, they took a back seat. Taylor, of course, was generous in crediting them. But after Thursday's experience you almost expected one of them now and then to step out front and cut a groove. 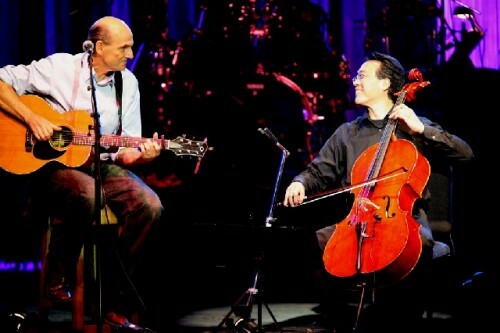 Instead, that function was served by the special guests, rocker, Sheryl Crow, and cellist, Yo Yo Ma. Which ain't chopped liver. My goodness. Some enchanting evening. In spades. While always an easy and charming host this time there was a lot less chatter between songs. There were fewer quips and anecdotes as JT stuck to the music. There was the cavernous shed to fill and project back out to the lawn. Given the occasion there were much improved production values. During the usual Tanglewood concerts there are a couple of large monitors on the edge of the cornice for the benefit of lawn patrons. This time, however, they were well placed throughout the Shed, with small monitors near the stage, and a couple of large screen high def ones staggered half way back. There were also additional screens on the sides of the Shed allowing everyone to get a view of the performance even those with obstructed sight lines or lawn seats in Siberia. In addition to the extra hi def screens, which we would like to see as a standard Tanglewood feature, the projected images were mixed using multiple fixed and mobile cameras. The images were able to zoom in on details allowing us to focus on the left hand of Ma creating that renowned vibrato. Or Taylor's expression while enraptured by the lyrics of a song. The program started when Taylor just ambled on stage, to a Standing O, and evoked a tender ballad "Secret of Life." It is interesting that he opted to open with such a dense message song. Hey guys, this is pretty serious stuff. Especially when he reminded us that "It's just a long lonely ride." Thanks, we needed that. Given the nature and circumstance of the evening it was a bit ironic that he followed with "The Water Is Wide." To set the mood he greeted the audience. "It's been a bit of a soggy summer. But I am so stoked to see you all. How about it for all you folks out on the lawn (Tremendous roar that echoed into the Shed). You are a plucky lot. (He took delight in that choice of word). Perhaps if we just ignore it the rain will go away. (It didn't. Actually, it poured as the evening progressed.) This song is from England or Ireland they both claim it." 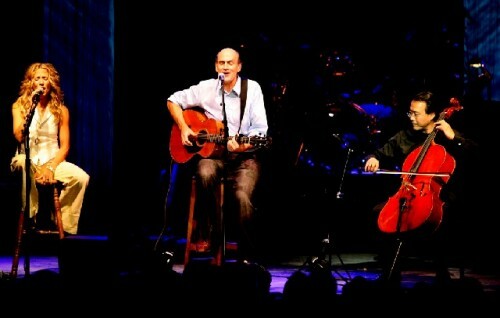 He then introduced Andrea Zonn who backed him with sensitive and sensual fiddle. Feeling for the misery of many patrons he again addressed the plucky souls. "I am dedicating the next song ("That's Why I'm Here") to the folks on the lawn. The umbrella people." This was followed by a couple of songs from "My home state of North Carolina." The first was "Copperline." There was an enormous burst of applause and recognition when, for the first time that evening, two days actually, he played a hit. From that landmark debut album on Apple records, way, way back in the 1960s, remember them, he sang "I'm Going to Carolina in My Mind." Back then I was shocked and disappointed when my colleague at Boston After Dark (later the Boston Phoenix) Ken Emerson trashed that first album. I loved those songs. About that time I heard Taylor in a club in Cambridge and spoke with him briefly after the gig. That summer with Rick Robbins, who was a friend of Arlo Guthrie, we sat on the bed of the Viking Hotel in Newport while JT rehearsed "Carolina" with Guthrie. Arlo was a star featured in the Newport Folk Festival. 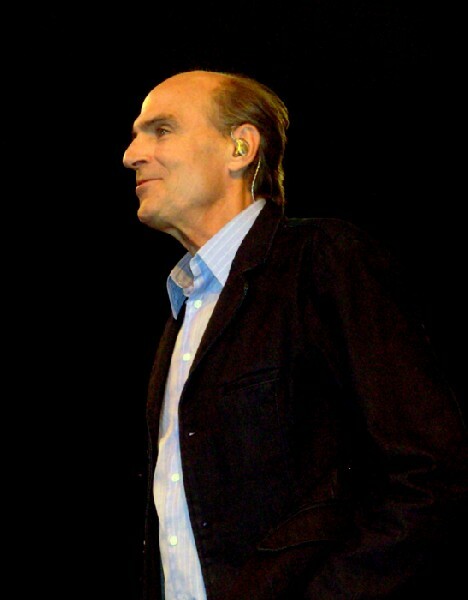 The plan was that he would bring on James as a new artist and special guest. Decades later I recall that moment of being a fly on the wall. So the song is always very special to me. Getting me all choked up and stuff. Having satisfied the audience by finally serving up a hit tune Taylor gradually picked up the pace. He slid into "Stop Thinkin' Bout That." Evoking the acid etched 60s with references to Sushine (a signifier of those cool aid capped Owsley Sunshine tabs of LSD, trippy man) there were many period inflections on "Blossom." If you didn't make it to Woodstock (but saw the movie) most of the sly references just slid on by. This was followed by the bluesy "Handyman" which kicked up the band. Then another weather analogy for "Shower." There is the wonderful refrain of "Shower the one you love with love." Nearing the end of the set he brought out Sheryl Crow. Playing a bass guitar Taylor and the band backed her on "My Favorite Mistake." It was a familiar refrain about how nice girls fall for bad guys. The lucky ones get over it but this melancholy tune lingered on the bittersweet memories. The set ended with Crow and Taylor romping through "Mexico." In another slice of life reference Taylor opened the second set with 'Traffic Jam" with all the honking horns of frustrated drivers. It was an all too obvious reference to the thousands trying to inch their way out of tiny Lenox after the concert. As veterans of Tanglewood we have our escape strategies down pat. With a masterful touch Taylor was able to deftly raise and lower the thermostat of the program. After that opening number the band exited and the audience roared its approval when Yo Yo Ma walked on stage. 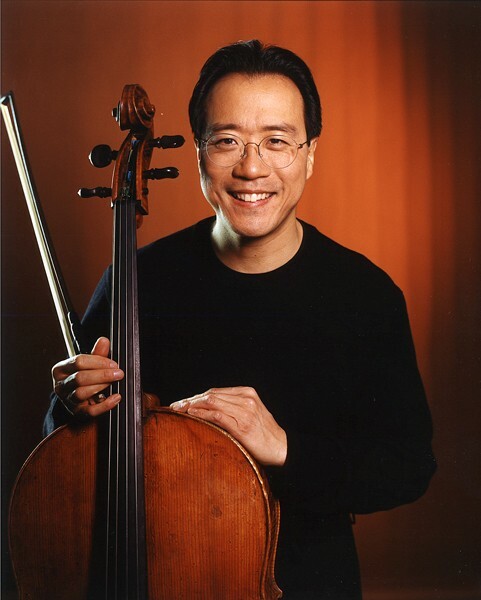 "I can't say how pleased and delighted I am to introduce my dear friend, the best there is, Yo Yo Ma. When we talked about playing together I asked him if there was something not so complicated." Taylor did his best to pick along with a moody rendering of a Schumann lullaby. It was just stunning. And positively thrilling when they performed the Carole King/ Gerry Goffin standard "Friend." The lyrics have never felt more insightful. It was just glorious. Then Crow joined them and it got even better with Taylor's early masterpiece of loss and memory "Fire & Rain." He reminded us that it was written in Stockbridge. At the time he was a resident at Austen Riggs and knew Suzanne the inspiration for the poignant song. Then it was Crow's turn "Wildflower" backed by Ma and Taylor. When Ma departed Crow told us how special it had been to perform with him. She grew up in a household of classical musicians and pursued piano through her college years. "There would be four of us practicing piano, all at the same time" she said. "We had six pianos in our house. My mom would be in the kitchen shouting out to us." She would tell the children what was wrong with their playing. For Sheryl the criticism was "Stop being so James Taylor." The audience was delighted when Crow was featured on "Strong Enough" a challenge to a man seeking a relationship with her. She's one tough lady and a belter. Roadies kept feeding her new guitars as she rocked out with the band. Then showing the down side of love she morphed from challenging a lover into the anxious "Hard to Make a Stand." By now JT was on a roll. Crow and the backing singers exited as he launched into the bluesy "Steamroller." It turned into a parody of soul as Taylor mugged and grimaced with comic impact. He switched to a hard body guitar jamming with guitarist Michael Landau. It was rather comical when he even leaped into the air, flailing about like Pete Townsend of the Who, or launched into an ersatz Chuck Berry Duck Walk. Taylor and Landau were down on their knees trading licks. I wondered when, like the 60s rockers he parodied, Taylor would smash his guitar on the stage. But that was not to be. There is a difference between a 60s rocker and a rocker in his 60s. Taking it back a notch he performed another Carol King standard "Up on the Roof" a classic for The Drifters. He took it at a faster pace and more as a rocker. This slid into "Smiling Face" then he brought Crow back to close the set with the 1965 Marvin Gaye anthem "How Sweet It Is to Be Loved by You." The audience was on its feet and stomping for more. Taylor and Crow delivered with a delightful version of "Mocking Bird" " "All I Want To Do" featuring Crow. Then brought it all back home with Taylor's classic "Sweet Baby James." Exactly.